Now you can own a signed limited edition print, (only 50 printed), by a successful Wildlife Artist using an original medium. At an affordable price! 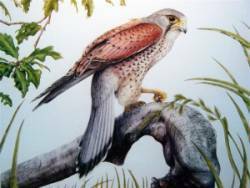 Image shows Another of Nick's Birds of Prey "Kestrel on a Birch tree",in an acid free mount.Size of the print is 12" by 15"(38cm by 30.5cm)This is signed and numbered limited edition of 50 only.Printed to a very high resolution and standard, on superb quality paper with fast inks to guarantee total colour strength for at least 80 years under normal conditions. 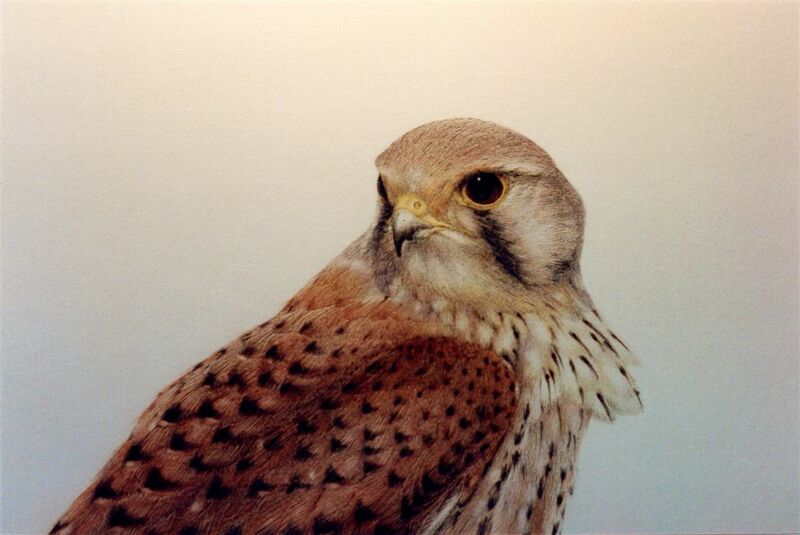 The preferred diet of the common kestrel is, like the Barn Owl, short tailed field voles. Unlike its nocturnal counterpart though, it is able to exploit other food sources, and will happily consume other voles, mice, shrews, small birds and even earthworms. Generally a quiet bird,(whose latin name tinnunculus comes from its voice) can be very noisy around breeding time and when threatened. At these times its most common call is a piecing kee-kee-kee. Until relatively recently, with over 70,000 breeding pairs, outnumbered all other raptors in Britain. Indeed it had been estimated that there were more kestrels in Britain than all other diurnal raptors put together. That situation has changed over the last decade - declines in kestrel numbers over the last ten years have been in the range of 20-50% (average about 30%). There are now probably less than 50,000 pairs in Great Britain. One possible cause of this decline is a reduction in small mammal numbers. When you see one hovering at roadsides, however, it is unmistakeable, and you can often get close enough (particularly with binoculars) to obtain a good view of its colour and markings. The sexes are easy to tell apart, as the male has the grey head and tail. The they frequently mate for long periods, if not for life, and nest wherever thay can find a suitable secluded box or hollow. They lay 3-5 eggs, which are incubated for 26-34 days. The chicks are very vulnerable to cold for the first 10-14 days, because all of the energy they receive from food goes to support their phenomenal growth rate. The young fledge at 27-32 days but need to be fed by their parents for a further 3-4 weeks, as the skills of hovering and hunting efficiently take time to acquire. Britain's most successful raptor At virtually any time of the day, along many stretches of road, particularly busy dual carriageways, you will see a bird hovering, searching for food. This bird is the kestrel. The reason it is there is because, during their regular movements, small rodents, especially field voles, find the busy road to be an impenetrable boundary, and they tend to congregate there in quite large numbers. Add to this the fact that many roadside verges are not tended too well, and present a ready habitat for small creatures, and you have a well planned, and well stocked larder for those creatures which prey on them. These creatures are, primarily, Kestrels and Barn Owls. There are, however, serious drawbacks to this - each year many thousands of kestrels and barn owls die or are badly injured as a result. To buy "Kestrel on Birch Tree"
Image shows, "Kestrel - bust" in an acid free mount.Size of the print is 12" by 15"(38cm by 30.5cm) This is signed and numbered limited edition Bird of prey of 50 only. Printed to a very high resolution and standard, on superb quality paper with fast inks to guarantee total colour strength for at least 80 years under normal conditions.You will be very impressed with the price and the quality of this mounted print.